Are you experiencing Back Pain in Duluth, Georgia? If you hurt your back and need treatment to help relieve your chronic back pain, our experienced Chiropractors at our Duluth office may be able to help with your recovery. Our Back Pain and Injury Clinic in Duluth has a team of Doctors who will find and remove spinal misalignments to ease your muscle tension around the injury; this will allow proper communication to transfer between the brain and body, restoring function to your nervous system. Many of our patients in Duluth experience reduced pain and have avoided surgery after the mechanical interference in the spine has been removed. 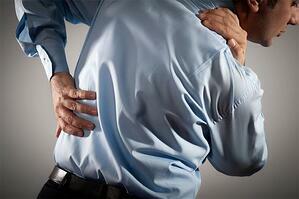 We offer a free consultation to Back Pain Injury victims in Duluth! According to The Association of Chiropractic Colleges, "Chiropractic is a health care discipline which emphasizes the inherent recuperative power of the body to heal itself without the use of drugs or surgery. Suffering a trauma injury can lead to a spinal misalignment in the body. When an accident causing the spine to becomes misaligned, it will distort the natural structure and irritate the ligaments, nerves, bones, and discs causing severe Back Pain or Muscle Tension. No matter how minor the accident nerve damage can still cause a misalignment either instantaneously or over a long period of time. Our Duluth Back Pain Doctors will perform a complete spinal examination to make sure the spine is free from misalignments. They will also provide natural therapy methods to help alleviate the pain. A repetitive stress or overuse injury that occurred due to a work-related accident or sports injury can cause the spinal nerves to become impeded. When this happens, it can negatively affect the range of motion, strength, reflexes, endurance, and, performance. Our Back Pain Doctors in Duluth can help restore your body to normal function and get you back to your best at work and play. Chiropractic Adjustments: Manual manipulation helps to relieve back pain by taking the unwanted pressure off the sensitive neurological tissue. It will also help restore blood flow, increase range of motion, reduce muscle tension, and create a series of chemical reactions in the body that will act as a natural painkiller. When this treatment is coupled with adequate hydration, the body will quickly begin the healing process. Pelvic Stabilization Drills: If a patient has a leg-length deficiency, flat feet or subtalar instability, our Duluth Chiropractors in may prescribe a small heel lift for the shoe to help the short leg stabilize the pelvis and correct the walking gait. By changing the pattern of the walking motion to be more anatomically friendly, your body will react by eliminating its tension holding patterns and your Back Pain may be reduced dramatically. Traction and Decompression: A traction massage is when the patient is lying face up as a system of rollers move around the back, massaging and stretching the muscles that are causing the back pain. Our Chiropractors may use other traction devices to stretch the spine and decompress the discs. These therapies work well for patients suffering from Degenerative Disc Disease, Sciatica, Bulging Discs, or Herniated Discs. Electrical Muscle Stimulation Therapy: Many patients benefit from this therapy when they are experiencing cramping or muscle spasms. Electrodes are set on the skin, and they send light electrical pulses to different locations of the body with the purpose of reducing inflammation in the muscle or joint. This therapy helps settle muscle spasms and relieve symptoms of Back Pain. Ergonomics Training: During the course of your Back Pain treatment, your Doctor may recommend some modifications at your place of work or a change in the way you are sleeping. There are an excessive amount of demands that placed on the spine every day. The spine holds up the shoulders, head, and upper body. It offers support so a person can stand up straight, the flexibility to twist and bend while protecting the spinal cord all at the same time. Every vertebra in the spine articulates or joins or with other joints around it, to form a movable joint. Cartilage lines the joints and forms the disc, which is made of cartilage that acts as a shock absorber for the spine. If the joint is misaligned and not moving properly, the cartilage and your spinal discs go through a slow process of decay. If you are suffering from Back Pain in Duluth, you should contact our office for immediate assistance.Do not wait until you pain becomes worse. At Arrowhead we have the necessary skills to help with your recovery. If you have been injured and are suffering from back pain, you may be in need of an experienced Back Pain Doctor in Duluth, Ga.
Click on the link below for a Free Consultation at our Duluth Clinic!